LeBron James, the NBA's reigning two-time MVP, ended months of speculation and suspense by telling the world Thursday night he'll play basketball next season with the Miami Heat. "This is tough," said James. "This is very tough because you feel like you let a lot of people down." In the hours before his choice was revealed, the sports world spun out of control with speculation and rumors. 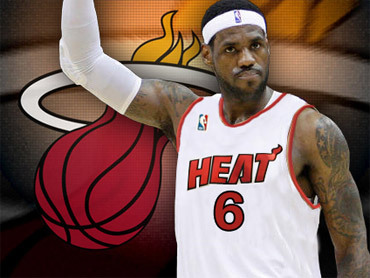 Some reports said he had told his inner circle he was leaning toward the Heat. "The best opportunity to win and to win now and to win in the future also," James said Thursday night. "Winning is a huge thing for me." It's a huge victory for the Heat, who got commitments from Dwyane Wade and Chris Bosh on Wednesday. That duo, along with James, formed the upper echelon of the most-celebrated free-agent period in league history. He said he made the decision Thursday morning and knows it won't go over well in Ohio. "They can have mixed emotions, of course," James said, adding that Akron will "always be home for me." The report that James rented six cabanas at the W Hotel in South Beach for a post-decision party only added more fuel to the fire that the sought-after star had set his mind on the Sunshine State. About 12 hours after Bosh joined Wade in committing to the Heat, two reports emerged Thursday morning saying James was leaning toward joining them. Newsday first reported via Knicks beat writer Alan Hahn's Twitter account that James "has decided to join Dwyane Wade and Chris Bosh in Miami." The Long Island newspaper followed up with a published report saying that James "is expected to choose the Heat," citing multiple NBA sources. Season-ticket sales for the Heat's coming 41-game season were suspended Thursday afternoon after the entire supply of available seats were sold out. Not every seat has been released for sale yet and some will be held back for single-game purchases at the 19,600-capacity arena. ESPN televised James' decision live from a Boys & Girls Club in Greenwich, Conn., a group with which James has a relationship. The TV special should raise at least $1 million to help refurbish gyms under a program that James' foundation will help direct, and kids from the Greenwich club were invited to attend the announcement, Frank Sanchez, the vice president for corporate and partner relationships for the Boys & Girls Clubs of America, said. Dustin Dobbs wore a James jersey and carried a small radio to listen to the announcement - one he said merited all the hype. "He's the face of basketball today," the 18-year-old from Westport, Conn. said. "This is all worth it." "He's either going to be my favorite player tonight or the most hated player," Mendell said. The Cavaliers came close to winning it all with James, who at 6-foot-8 and 260 pounds has the quickness of a point guard and brute force of an NFL defensive lineman. As the clock ticked down to James' announcement, northeastern Ohio was on edge. James has always preached family and loyalty and commitment as his core values; he even has "Loyalty" and Akron's area code of "330" tattooed on his chiseled body.